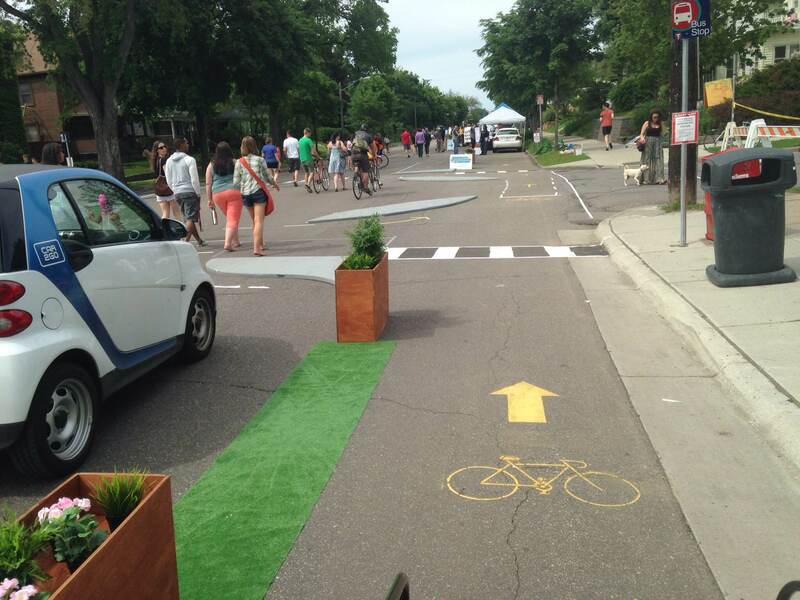 The Minneapolis Bicycle Coalition installed this pop-up design at an Open Streets event to show neighbors what a protected bike lane could look like. All photos courtesy of Sam Rockwell. Sam Rockwell rides his bike every day from his home in Minneapolis to his office at BlueCross BlueShield of Minnesota in Eagan, 12 miles away, where he spends his days plotting ways to get other people riding their bikes too. By all accounts, Minnesota is doing a pretty good job on that front. One way Rockwell — and his co-conspirator at BlueCross, Eric Weiss — are looking to make healthy, active transportation even better is by installing temporary “pop-up” infrastructure around the state so people can take new street designs for a test ride. Despite relatively high levels of biking, Minnesota has somehow neglected to install even a single on-street protected bike lane — though Minneapolis has approved a plan to build 30 miles of them by 2020. Weiss, Rockwell, and the advocates they work with use pop-up installations to help local leaders and residents see how the infrastructure will look. At Weiss and Rockwell’s upcoming workshop at Pro-Walk/Pro-Bike, participants will create their own pop-up street designs. BlueCross BlueShield of Minnesota is a primary sponsor of Open Streets, which gives car space back to people by temporarily closing the streets to motor vehicles and opening them up for play, socializing, food trucks, and other community activities. This year, 14 communities will hold 30 events in the state — and six of them will include pop-up installations of safe streets infrastructure. The initiative has spread far beyond the Twin Cities. 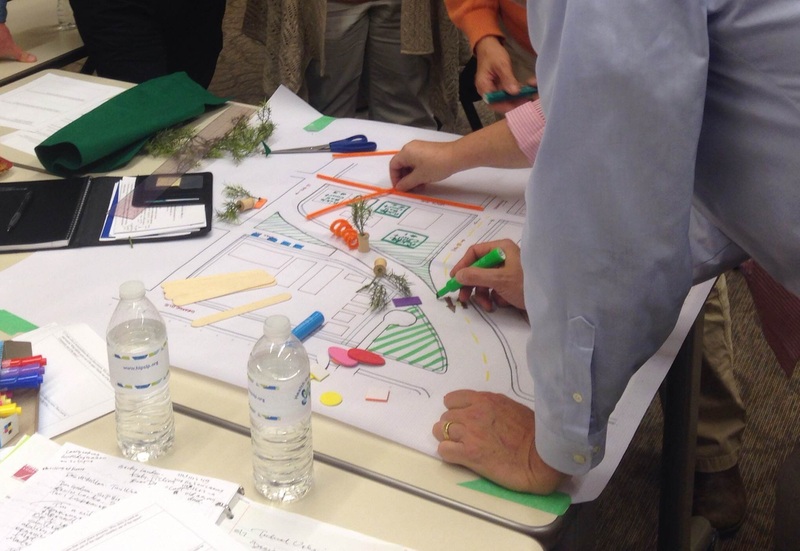 Weiss is helping Duluth design a portable “park” made out of re-usable materials and patio furniture that will rotate to various vacant or underutilized spaces downtown. The installation will also include wayfinding signs showing how long it takes to walk to certain destinations. Weiss is also working with Fergus Falls, Minnesota — a small town about 50 miles southeast of Fargo, North Dakota — on several projects to revitalize downtown, engaging businesses, installing new benches, painting temporary bike lanes, and jump-starting unrealized, century-old plans to build a downtown plaza and auditorium. And then in Columbia Heights, an inner-ring suburb just north of Minneapolis, Weiss and Rockwell are putting their pop-up town hall concept to use to find out what residents are looking for in the redevelopment of downtown. They essentially hold a festival and sneak a public meeting into it. A parklot, or portable park, in Minneapolis. At Pro-Walk/Pro-Bike, participants will get to experience Weiss and Rockwell’s methodology. They split participants into groups and provide each with (1) a drawing of an intersection, block, or small section of a neighborhood, either rural or urban; (2) Google Street View pictures of the area (although they keep the identity of the area secret); and (3) a one-page description of the area’s demographics, economy, community goals, and any other relevant information. Though lots of pop-up interventions, sometimes known as “tactical urbanism” (though Weiss and Rockwell have learned not to use language like that in places like Fergus Falls), have been done guerrilla-style, Weiss and Rockwell have found it helpful to work with municipal governments and nonprofits to create permitted installations — both daylong pop-ups and more enduring pilots that test out a piece of infrastructure for weeks or months before being evaluated. 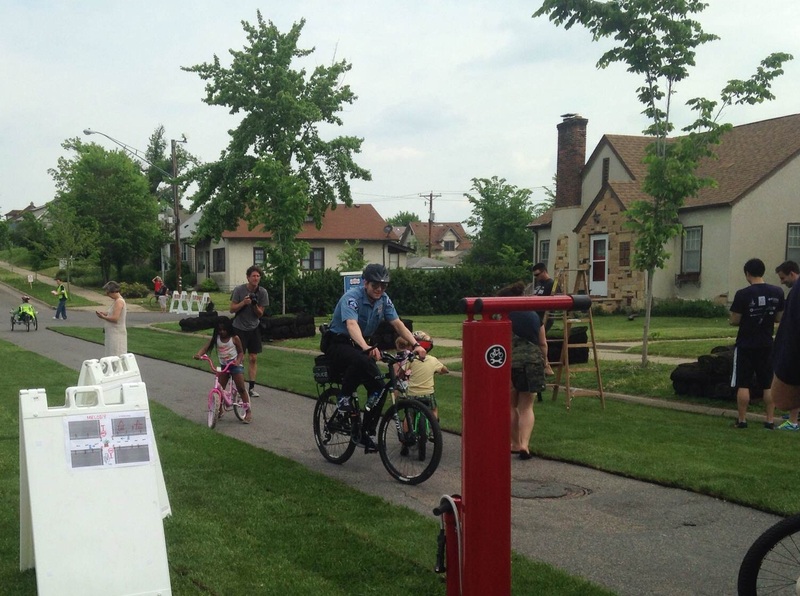 The Minneapolis Public Works Department helped them gather traffic data along the corridor where they’re planning a greenway in north Minneapolis that would transfer right-of-way from cars to bikes. 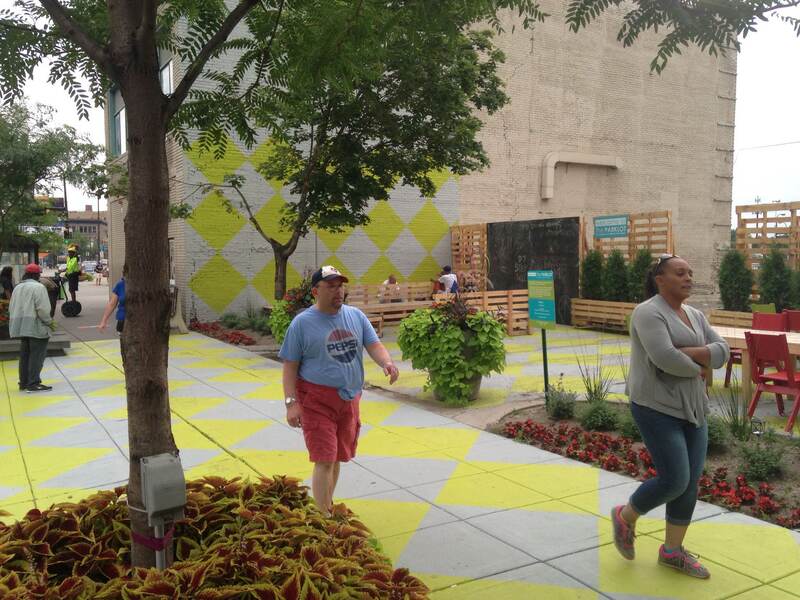 As the city explored the concept, they held an Open Streets event in which they put down sod to demonstrate to the community what a greenway would look like. The city worked with Rockwell and Weiss to lay sod over asphalt to show residents how a new greenway in North Minneapolis could look. But in some cases, the people who most need to see the temporary installation are city and county officials, who are themselves stuck in the “haven’t seen it/can’t support it” cycle. In those cases, sometimes it’s helpful to go rogue, installing temporary street designs at night and letting the media and public officials experience it for themselves before they knock it. This was tried in Cleveland but nothing permanent ever came of it. Benches, plazas, greenways – I’m digging all of that. But in that first photo, can you see the car hidden on the left (not pictured) that’s about to right hook you? Can its driver see you and stop in time? I didn’t think so. Cycletracks kill. I would be much less stressed out with some nice lane-centered sharrows, “Bikes May Use Full Lane” signs, and a 20mph speed limit. Really take back the roads for people. Right hooks are virtually null under such a design. They’re specifically addressed by this design and talked about in the video. That can (and should) work on a lot of quieter streets, but cannot form a city’s entire bike strategy, especially when it comes to busier routes such as arterials. I disagree. The design also accounts for the situation that you describe. If you look ahead there is a second curb preventing cars from making a right before cyclists are visible. Here is a link describing this design. Saying that Cycletracks kill is silly. Obviously, cycle tracks are not ideal for every street. Maybe even the street pictured above would be better off with some speed calming devices and sharrows, however, there are many streets in many cities that would benefit from protected bicycle lanes and intersections. Is the Pro-Walk/Pro-Bike/Pro-Place Conference open at all to college students? I’d love to go and experience this workshop! The only way to “take back a road” is to redesign it with cyclist safety in mind. No amount of sharrows or signage will keep you safe if a car isn’t looking for you. Minimizing car-pedestrian interactions is the best way to do this, which cycletracks accomplish in spades. Yet drivers still seem unaware of them and they don’t have enough street-calming to be truly effective. They’re still used as through routes for cars, who get incensed at having to sit behind a bike that dares not to cower over to the right in the door-zone. I’ve been and seen others verbally harassed all the time biking on Berkeley’s Bike Blvds–it’s so ugly the city has a specific anti-harassment ordinance in place now but it still doesn’t really change the day-to-day, which must be accomplished through better infrastructure. Sure, I know I’m not doing anything wrong by using them, but it certainly is far from pleasant, to say the very least. And that’s *precisely* how you keep modeshare in the single-digits and ironically more people in their cars directly or indirectly contributing further to the problem. –> road diets. The average American suburban street (such as that Berkeley example above) is still very wide, giving visual cues to drivers it’s safe to speed. You can’t just slap a Bike Blvd stencil on a road and call it a strategy. –> very frequent dead-ends for cars, but go-throughs for bikes/peds. You can’t just have a planter every half mile. At any point a driver should be seeing a dead-end ahead where they will have to either U-turn or turn right/left or something. We also need to accept that above certain speeds and vehicle counts per day shared space is not viable, in which cases physical protection via cycletracks is required. Sharrows and low speeds didn’t stop the girl in front of me on my ride to work this morning get wiped out by a car. Sharrows and integrated bike/car traffic don’t help my wife feel safe enough to want to ride everyday (and after this morning, I’m totally freaked out myself).